One rarely imagines a history museum as a treasure trove of visual arts. Sure, historical artifacts and cultural relics can, in many cases, be considered of the artistic variety, but it’s not a place I usually think to go to for creative immersion. However, a current exhibition at the NC Museum of History changed my notions of experiencing art via history museums. 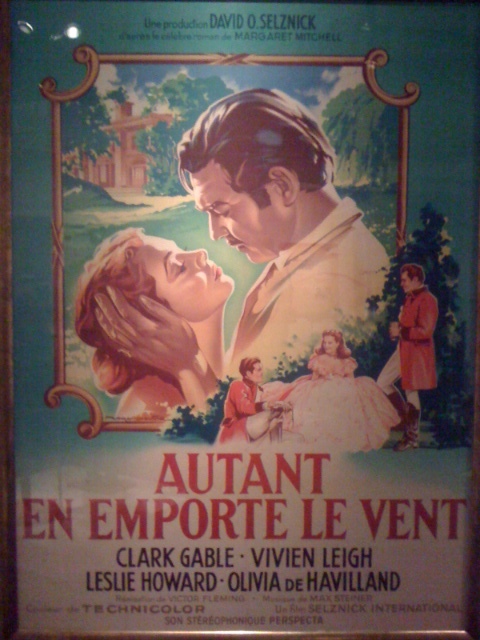 Through January 13, 2013, the museum is hosting the unique exhibition Real to Reel: The Making of Gone With The Wind. It is a show centered around the creation of one of the most celebrated films in the history of Hollywood, especially down here in the South. Gone With the Wind is truly a classic piece of cinematography. The film was released in 1939, based on Margaret Mitchell’s Pulitzer Prize-winning novel of the same title. An instant hit, the movie racked up 10 Academy Awards out of the 13 for which it was nominated, including the award for Best Picture, trumping a personal favorite -- The Wizard of Oz. I consider this exhibit to qualify as “the arts,” as film and movie creation is no doubt an artistic endeavor. Real to Reel not only features less-than-well-known facts about the famous flick, but a cornucopia (yes, Thanksgiving is on my mind) of items from the collection of James Tumblin, hair and makeup director of the film. Of his collection, the museum currently houses furniture, props, and costumes all used on the movie’s set, as well as original movie posters, and pretty much any other bit of random GWTW memorabilia one can imagine. My favorite relics include a case of dolls in elaborately designed dresses based on costumes from GWTW, handmade by North Carolina artist Pete Ballard. 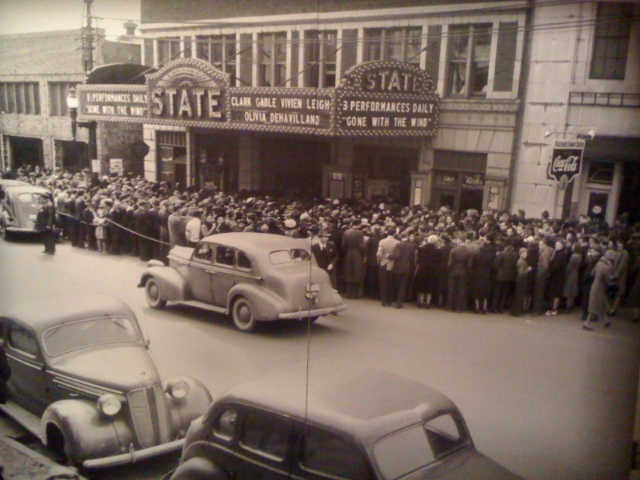 I was similarly wowed by incredible black and white photography -- I lingered beside a large black and white photo of a massive crowd forming outside downtown Raleigh’s The State theater, circa 1940, for the premiere of the much-talked-about Gone With the Wind. My favorite nook by far was the room filled with production paintings, original poster artwork, and storyboard paintings. 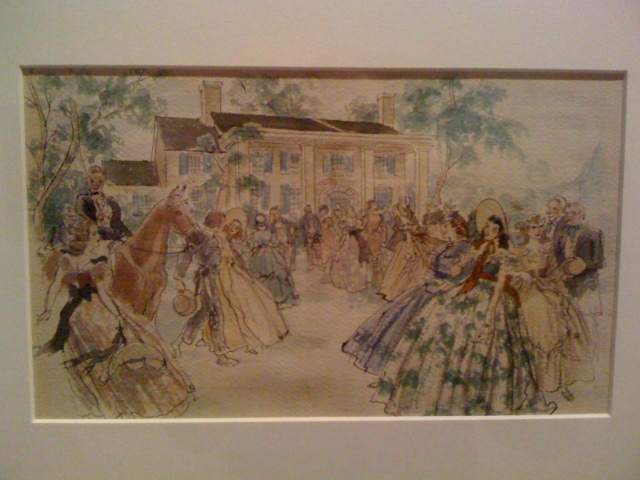 In addition to art and artifacts, the exhibition features fascinating GWTW trivia. A few of the random facts with which I emerged from the building include: In early drafts of Margaret Mitchell’s book, Scarlett was named “Pansy O’Hara,” which I’m glad they changed because that seems just a little over the top. Also, drop-dead-gorgeous Vivien Leigh, who played Scarlett, absolutely despised kissing famed mega-hunk Clark Gable because of his very false teeth and horrid case of halitosis. I mean, gross. That changes the way I look at him a little bit.